How to find the perimeter of a parallelogram using this calculator? If you ever wondered how to find the perimeter of a parallelogram, this parallelogram perimeter calculator can help you in no time. Not only we implemented the easiest well-known equation but also two other parallelogram perimeter formulas. Why not give it a go? Check out also twin brother of that calculator - parallelogram area calculator - to get to know this shape better. But what if we don't have the length of the two sides? The adjacent angles in the parallelogram are supplementary, so you can choose whichever angle you want because sin(angle) equals sin(180° - angle). Determine which part of the calculator is the one you need. Assume it's second part. Parallelogram perimeter calculator displays the value. It's 60 in². 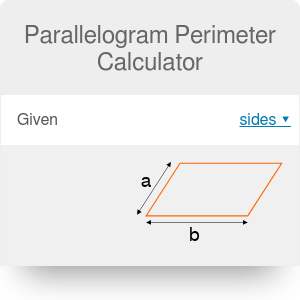 If you are happy with the results from parallelogram perimeter calculator, maybe you want to check our other geometry calculators? Parallelogram Perimeter Calculator can be embedded on your website to enrich the content you wrote and make it easier for your visitors to understand your message.